Confessions of a Liberal Mind: Crazy stock? Lets put it right out there! I read this whole column, and I may feel indignant to be called a spear chucker. But please, could someone teach this guy how to write a proper article. Don't they teach you how to write in bible college? We know Stockwell is all about adam and Eve running around with the dinosaurs 5000 years ago, and other various crazy ideas. He also back-handedly complimented Ajax-Pickering MP Mark Holland, calling him "Perry Mason on steroids", in regards to the committee meetings on the RCMP and Arrar probe. I read his article, and for someone who once wanted to be prime minister, he wrote his column at such a low level I found it painful to read. The gaps between sentences, made me feel like he was just brainstorming ideas and putting them down to look organized. So, please Stockwell, get someone to properly edit and form your thoughts. Politicians already have enough bad reputations, hack columnist who write at the same level of a teenager isn't one. Please Stock, edit, rewrite, edit again. And spear-chuckers, what kind of slang is that? I have never heard that before, seriously. 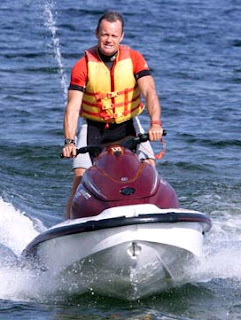 One last thing, why didn't he ride a Canadian built Sea doo?